Turns out the phrase “flat as an ironing board” isn’t hyperbole after all. My Love Story!! took a week to be a sports anime—er, kinda—as the high school judo clubs begs Takeo (on hands and knees!) to join for a month and help them defeat long-time rival Bianka High School in the 19th Annual Shuu-Bi Match. 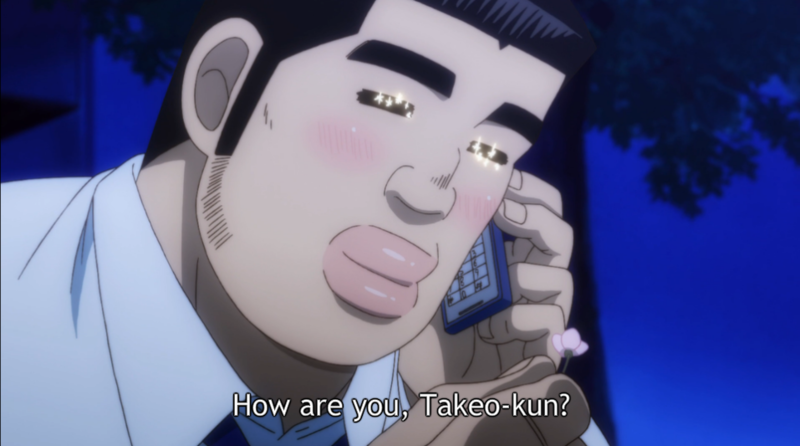 Takeo responds like Takeo—with an immediate and resounding “OKAY!”—but his resolve wavers when Suna points out this means he won’t be able to see Yamato very much for a while. Yamato encourages him to do it anyway, ‘cause Takeo being a good Samaritan and tossing people around on a mat sounds like the hottest thing ever to her ears. Time for a training montage! …Sorry. 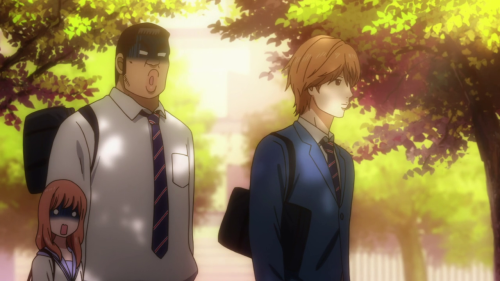 It’s a constant challenge not to dissolve into reaction gifs and adorable screenshots, and, much like Takeo, my resolve often wavers in the face of Yamato’s cuteness. We’re good now. Promise. 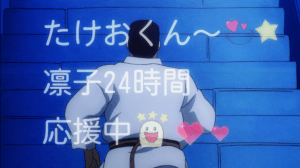 Once the match itself arrives, Takeo finds himself pitted against former teammate/rival Tsuyoshi Iwayama, who’s convinced Takeo is a weakling now that he’s wasting his time on girlfriends instead of martial training. But, after a grinding and reasonably well-animated battle (our animators are trained in sparkles, not fight scenes! ), Takeo emerges the victor! For real strength comes not from one’s muscles, but one’s heart! Especially when one’s heart is filled with assorted rice balls, heart-shaped scones, emoji-filled texts, and starry-eyed (literally) phone calls. 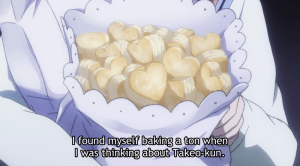 There’s nothing surprising about how all this goes down, but that doesn’t stop it from being charming as heck, nor does it keep this from being my favorite episode since “My Blue Ogre” melted me into a gibbering puddle of “So Cute”s and “I Can’t Even”s a few weeks back. Despite its flaws, OreMono continues to handle its romantic elements with a winning blend of realism and sweetness, giving us a relationship we can actually root for instead of groan over. Which is awesome for me, sure, but even better for the target teen audience, who could really use some healthy romances in their fiction. 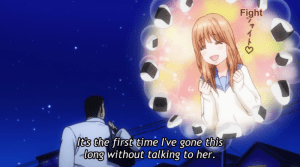 Even better, OreMono continues to highlight that the vast majority of our couple’s “problems” come from communication issues and general first-relationship anxiety rather than incompatibility or some glaring personality flaw. The main “conflict” is week is because Takeo forgets to explain why he doesn’t want Yamato to visit him after practice (it’s dangerous to be out at night), and instead of asking him about it, she jumps to worrying that she’s a hindrance or a distraction. Like the stars that Yamato and Takeo turn into constellations, people’s actions and motivations are points you have to connect into shapes, so that (as Suna notes) “you can see anything you want.” It’s open to (mis)interpretation, and it’s easy to let your fears get the better of you, making you connect the dots into a worst-case scenario. 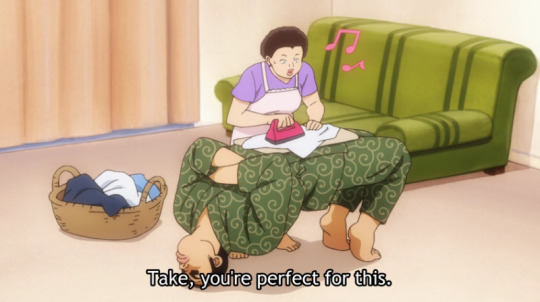 Like a lot of young couples, Yamato and Takeo both have a habit of doing this. Lucky for them our resident sage Suna is around to work as Couple Interpreter and keep the drama to a minimum. Most of Takeo and Yamato’s anxieties this season have been ones of their own making, and ones they could have easily remedied by simply addressing the other person head-on. 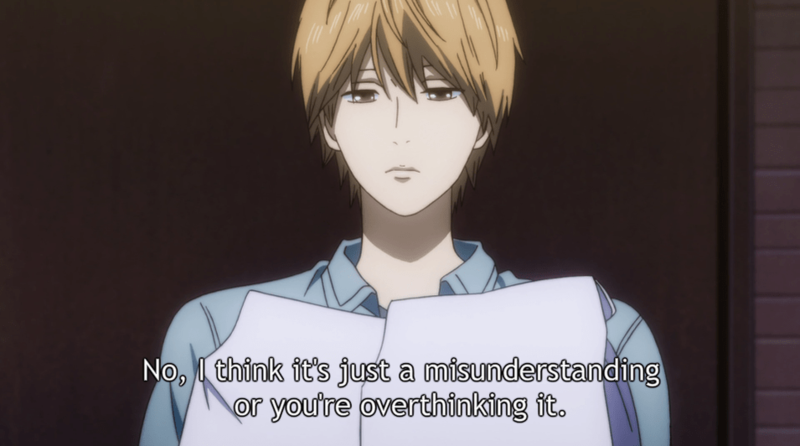 It’s a barrier they’re going to have to keep working to overcome (they won’t always have Suna around to translate for them, after all), but it’s one common to even the healthiest of couples, and especially young ones. Here’s hoping they can find a way to remove the middle man a little more and just speak openly to each other, without fear of what they might lose. Oh, and speaking of hopes, next week’s episode is called “My Friend.” Could it be our long-awaited Suna Ep? I’ll cross all my finger and a few of my toes.